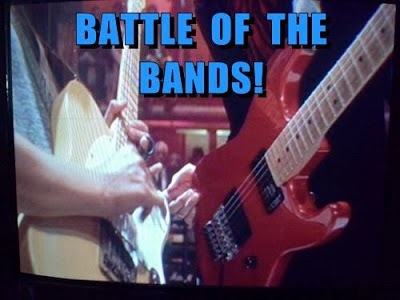 It's the first of the month and that means it's time for Battle of the Bands, the blog event started by the bloggers at Far Away Series and Ferret-Faced Fascist Friends. The point of the Battle is for you to listen to the songs presented below and then in the comment section tell us your favorite version and why you like that one the best. After you've voted here move on to the next participating blogs that you'll find listed below and vote on their match-ups. In the Battle I'm presenting in this post I've chosen a song that I'm pretty sure will be unfamiliar to most. Perhaps this will not go over with some of you, but my thought is that the purest Battle might be the one that starts out with no preconceived favorites or preferences due to having known a particular version. I think other Battles have shown an inclination for voters to go with the version they knew and discard the version that was "new" to their ears. This will be my experiment and we'll see what you think. No crazy 80's song in this match-up. I'm sticking with a relatively safe sound from the 60's. Let me know if you like the song in addition to telling me which version you prefer. Please don't let the "newness" of the song be off-putting to your sense of fair judgment. I will probably take this approach again in the future. That is unless I'm roundly lambasted by all for doing this. But of course it wouldn't be the first time. Wikipedia says: "Privilege is a British film directed by Peter Watkins. It was released in 1967...The story is set in the then near-future of the 1970s and concerns a disillusioned pop singer, played by Paul Jones, who is manipulated by the church and state which seek to turn him into a messianic leader." In his review of Privilege Roger Ebert said "This is a bitter, uncompromising movie, and although it isn't quite successful it is fascinating and important." I do not recall ever hearing this song in the film itself so either I missed it or it was only on the soundtrack of the album. The song encapsulates what the movie is about. Confusingly, on YouTube you can find recordings of "Set Me Free", another song used in the movie, listed as "Privilege (Set Me Free)". This song was later covered by Patti Smith. There are several places on the internet where these two songs have been confused. In this post I pit the original film soundtrack version by Paul Jones, who had been the lead singer for Manfred Mann, against the Canadian group The Sugar Shoppe. If this song was not actually used in the film, this version by Paul Jones certainly would have fit well in the context of the film. Paul Jones has been a significant presence in Britain's entertainment industry while remaining relatively unknown elsewhere. He's been associated with a number of notable music artists in his career, but is most known as the singer and harmonica player in the early inception of the band Manfred Mann. His solo career did not take off as well as expected after his starring role in Privilege, though he has remained a mainstay in film, media, and music in Britain. The Sugar Shoppe was Canada's answer to the Mamas and Papas. They were good, but never really caught on despite appearances on shows such as Ed Sullivan and Johnny Carson. Their album was critically well received, but only a modest seller. They were together only a few years before going their separate ways. Most of you have probably seen the leader of the group Victor Garber. He's had a solid theater, television, and film career, appearing in films such as Titanic, Argo, and Sleepless in Seattle. He played the role of Jesus in the 1973 film Godspell. Sci-fi fans might recall his role as Jack Bristow in the J.J. Abrams ABC series Alias. The album "The Sugar Shoppe" is a well-produced foray into the realms of "sunshine pop". Nice vocal harmonies with a strong back-up by top studio musicians bring an eclectic collection of tunes ranging from the vaudeville novelty sounding "Poor Papa" to the country flavored Bobbie Gentry "Papa, Won't You Let Me Go to Town" to the darker sound of "Privilege" featured in this Battle. If you're a fan of vocal groups, The Sugar Shoppe is a group you might want to explore further. By the way, the stereo separation in the video below is rather extreme as many recordings back then were. If you don't get a good balance of channels on your computer you can click the link above in the heading of this section to hear a scratchy mono version that is from a 45. You may want to listen to both if you're curious. Listen to The Sugar Shack's version of "Privilege"
I'll announce the winner of this Battle on Friday March 7th. If you'd like to read more about the background of why I chose this song, I hope you'll visit my post at my memoir blog Wrote By Rote. Nothing wrong with either version. The Sugar Shoppe has a more 60's-70's sound to it, which dates it just a bit more. I'd give this one to Paul Jones, but only by a hair. I am not very familiar with American music. How ever I find them both not too different. The song and both performers were new to me. The second version... Yeah, it had that Mamas & Papas approach, but in my opinion the harmonizing wasn't on the same level with The M&P. I thought this take on the song was fairly enjoyable too. Oh, Arlee, you know that there are some songs that we simply don't like. In those cases, NEITHER is the only true answer. However, that is not the case with this song. I actually enjoyed it very much. Both versions. The choosing is tough. So, the winner is taking this one by a hair. What I liked about Paul Jones... I really liked the instrumentation on the intro. It was dramatic. And it continued to be so as the song went on. I also really felt the frustration in the message of the lyrics in that version. The chorus is wildly upbeat (It's an honor to meet me... to have that privilege) while the verses reveal the dark underbelly of this guy's life. It's a wonderful dichotomy. Now on to The Sugar Shack, I mean The Sugar Shoppe... First of all, I must say that I am a huge fan of Victor Garber's work. Loved loved loved him Alias and I enjoy seeing him every time he pops up in a movie. I also liked the vocals of The Sugar Shoppe. I am a huge sucker for harmonies. I just love it. And I think I would really like their other music. Musically, I enjoyed this song very much. However, I didn't feel the angst of the message when they sang it. It didn't have the dramatic instrumentation and it is easy to miss the Bigger Message because you are happily tapping your toe along to the tune. Oddly enough, while you had problems on my blog, I am having problems on yours. From what I heard of the clips (could only get them to play small snippets of the song), the Sugar Shoppe was a little too "sixties" for my taste, so I'd go with the Jones version. Alex -- I think it's a close choice as well. Munir -- Thanks for trying anyway. StMc-- You should check out the entire SS album. I think you might enjoy it. Robin -- Sugar Shoppe too sugary. Paul Jones captured the angst and your vote. Larry -- There must be some kind of computer weirdness in the air (or cyberspace). Maybe it's the California rain. Another Paul Jones vote. I vote for the Sugar Shoppe, although it's a toss-up. The blending of the voices does at times have a hint of the Mama and Papas, whom I did like. I think both versions are cringe-worthy awful. However,"The Sugar Shoppe", was slightly less awful, in my opinion. A good weekend to you and thanks for the comments on my site, good sir. Another vote for Paul Jones here. His version is richer (for me), not just because of the orchestra but because his voice seems to have more character to it, more nuance. Someone mentioned the Sugar Shoppe had a distinct '60s feel, and I agree with that. Paul Jones' version might be dated as well, but there's personality in there, whereas the SS version felt more mainstream... more pop. Pff... I'm not making much sense, am I? Wow, looks like I'm swimming upstream yet again, but as soon as the girls started, I thought, "Mamas and Papas". I'll take Sugar Shoppe, if you please. DG -- Too bad Sugar Shoppe didn't attain the success that they should have. They were a good group. Gary -- Ooo! Harsh judgement. Not a fan of 60's music I guess? Guilie -- Since Paul Jones starred in the movie and was playing a role that was in accordance with the subject of the song, it seems appropriate that his personality should come through in his performance. CW -- I think you've made a good choice. Not familiar with this movie, song or the artists showcased. I like both versions well enough. The Paul Jones has a vibe/sound/whatever that reminds me of Johnny Rivers in his 'Secret Agent Man' days. Might just be me ( if you read my post, you know I'm pretty sleep deprived). The Sugar Shoppe did kind of remind me of a 'poor mans' Mamas and Papas. Sixties sound? Yeah, sure, but it's from the sixties, right? Anyway...I'm gonna go with the Sugar Shoppe and their sixties sound, 'poor man's' M & P's. Did all of that make any sense at all? I liked the bouncy 60's feel, and harmonies of The Sugar Shoppe. Thanks for pointing out Victor Garber, as I would've never recognized him. I think he also played Liberace in an earlier made for TV movie. If I must chose, Sugar Shoppe. Didn't listen to all that much of either. Faraway -- I don't know about "Poor Man's Mamas & Papas". You need to find their great album and listen to it all. Sugar Shoppe was modeled after the Mamas & Papas, but I think they took the ensemble format to another level entirely. They did some very nice stuff and had they recorded more I think they would have had a commendable catalog of music. Kelly & Damon- - Paul Jones it is. Julie -- Yes, I saw the Liberace credit on his list of roles. Jo --They were short songs. Hope you didn't find them tedious. How about a combination of both... Sugar shoppe with Paul singing.